1925: American Eagle Aircraft Co, 52 St and Prospect Ave, Kansas City MO (fdr: Edward E Porterfield Jr); 1925: 22 St and Harrison Ave. 1928: American Eagle Aircraft Corp, with refinancing by A A Durant & Co (NYC), Fairfax Airport, Kansas City KS. 1929: Merged with Wallace Aircraft Co. 1930: Merged with Lincoln Aircraft as (Victor H) Roos Lincoln Aircraft Co, Lincoln NE. 1931: Acquired by Porterfield Aircraft Corp. 1931: Bought production rights to Wallace Touroplane. 1942: Company sold to Columbia Aircraft Corp; Porterfield to Ft Smith AR to manufacture gliders until retirement c.1945. Company sold to Northwestern Aeronautical Corp, St Paul MN (neither Columbia nor Northwestern produced any Porterfield aircraft). 201, A-201 1929 (ATC 293) = 3pOB; 100hp Kinner K-5; span: 31'1" length: 22'11" load: 782# v: 115/95/30 range: 475. $3,995; POP: 44. Jack Foster. Successor to the Phaeton and the last of the American Eagle biplanes, the first one of which was converted in 1935 by Porterfield into the only biplane ever produced by that company [NC582H]. 251 Phaeton 1929 (ATC 282, 2-123) = 3pOB; 165hp Wright J-6; span: 31'0" length: 24'5" load: 801# v: 120/100/42 range: 500±. Robert T McCrum. Designed for the sportsman-pilot audience. $5,995; POP: 8, with 1 as A-139 clipped-wing racer. (2-123) superseded by (282). 251 Phaeton 1930 (ATC 2-121, 2-166) = As previous, refitted with 220hp J-5; length: 23'6" load: 907# v: 130/110/47. $7,795; POP: 2 [X516H, X/C872E], both of which were refitted with Wright J-6 under (2-121). (2-166) approved 150hp Hisso A or 180hp Hisso B installation. 330 1929 (ATC 119) = 4pChwM development of Wallace Touroplane B. 100hp Kinner K-5; span: 37'0" length: 23'10" v: 115/100/43 range: 500 ceiling: 14,000'. Noel Hockaday. Folding wings. A-1, A-101 aka 101 1926 (ATC 17, 2-48, 2-55) = 3pOB; 90hp Curtiss OX-5; span: 30'0" length: 24'1" load: 814# v: 100/85/35 range: 400; ff: 4/9/26. Robert T McCrum (also Waverly Stearman?). Model designation didn't appear until late 1927. Company's initial effort was designed to replace wearying war-surplus Standards at the Porterfield Flying School. $2,450, $2,515 in 1929, $2,985 in 1930. After receiving its ATC, the model designation was changed to A-101, offering 100hp Curtiss OXX-6, 150hp Hisso (2-55) as A Special in 1929 , 125hp Ryan-Siemens (2-48), 120hp Anzani, and 125hp Quick as A-1 Special [X4387] (length: 23'5"-24'6"). Design had dangerous spin characteristics, resulting in several fatal crashes, and was dropped in 1928 in favor of A-129. A-101-T 1932 (ATC 2-425) = 115hp Milwaukee Tank V-470/V-502. POP: 1. A-129 1929 (ATC 124) = 2-3pOB; 90hp Curtiss OX-5, and 100hp Kinner K-5; span: 30'0" length: 23'5" load: 800# v: 105/90/35 range: 500. Giuseppe Bellanca. Initially designed as a replacement for the Porterfield Flying School's A-101s, plane became popular with sportsman pilots. $4,895; POP: more than 400. 1929 company brochure shows length: 24'0" load: 850# v: 95/83/34 range: 475and manufacture under (ATC 17)priced $2,995-7,195 for eight engine options up to 200hp Wright J-4. A-139 1930 = Special clipped-wing 251 Phaeton as a racer, with 200hp Wright J-4 for Jack Foster at the 1930 Nationals [R562H]. Refitted with stock wings after it was found there was no particular benefit in the short spans. POP: 24. A-229 1929 = 2pOB; 90hp Curtiss OX-5. $2,995. A-329 1929 = 2pChwM; 90hp Curtiss OX-5. Advertised as available with 100hp Kinner K-5, 100hp Warner Scarab, 150hp Wright J-5, 170hp Curtiss Challenger. $3,995-7,995. [X100E]. A-429 aka Flyabout 1929 = 2pOB; 60hp LeBlond 5D; span: 27'11" length: 19'6" load: 400# v: 100/85/25 range: 340. Close copy of Longren Sport with steel-tube fuselage. Folding wings with bridge-truss struts; side-by-side single cockpit. $1,895-2,495; POP: 2 [363, X99E]. Optional 40hp Anzani with somewhat less performance. 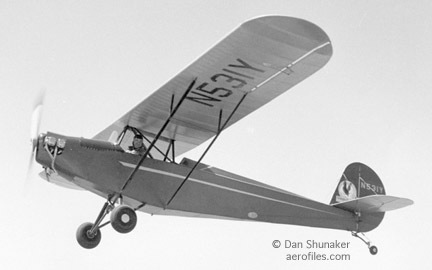 A-430 1930 (ATC 301) = 4pChwM; 165hp Wright J-6; span: 41'0" length: 24'7" load: 1133# v: 115/100/50 range: 600. Folding wings. POP: 2, [NC200N, prototype X/NC578H], the latter converted to E-430. A-529 1930 - Unknown twin-engine design. Project was scrapped soon after it started; assumed Walter Cross, Jack Foster. A-629 1929 = 6pO/ChwM; two 125hp Siemens-Halske; span: 47'0" length: 27'6" load: 800# v: 110/90/45. The only multi-engine ship built by American Eagle. Cabin seated four, with pilot and another passenger exposed to the elements in an open cockpit forward on top. $1,895; POP: 1, custom-built for Walter M Cross. 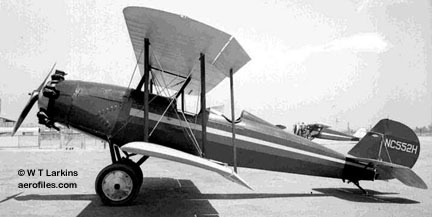 D-430 1930 (ATC 301) = 4pChwM; 165hp Wright J-6. Data similar to prototype A-430 [X/NC578H]; $7,395, $6,395 in 1931; POP: 1 or 2, converted to E-430 [NC200N]. E-430 1931 (ATC 302) = 4pChwM; 165hp Continental A-70. POP: 5, included 1 modified from A-430. Eaglet 130 1930 = No data [281N, 294N]. Eaglet 230 1930 (ATC 380, 2-303) = 2pOhwM; 30hp Szekely SR-3; span: 34'4" length: 21'7" load: 400# v: 80/70/30 range: 225. Noel Hockaday, Doug Webber. $1,475; POP: 80. Early models first had 25hp Cleone; first 33 produced under (2-303). Eaglet 231 1931 (ATC 2-387) = 2pOhwM; 40hp Salmson AD-9. POP: 2 conversions. Eaglet A-31 1931 (ATC 2-583) = 2pOhwM; 50hp Continental A-50. POP: 1 [531Y]. Eaglet B-31, -32 1931 (ATC 450) = 2pOhwM; 45hp Szekely SR-3; span: 34'4" length: 21'7" load: 413# v: 90/75/30 range: 240. B-32 had minor control modifications and range: 215. Also available with 40hp Salmson AD-9. $1,575; POP: 13 [X531Y, NC550Y, NC589Y, NC595Y/599Y, NC12522, NC12559, NC14420, NC17007, NC17686]. Production rights went to American Eaglecraft Co after WW2 as American Eaglecraft Eaglet. Trimotor "Taloga" 1926 = 4pOB; three 125hp Quick; v (est): 145. 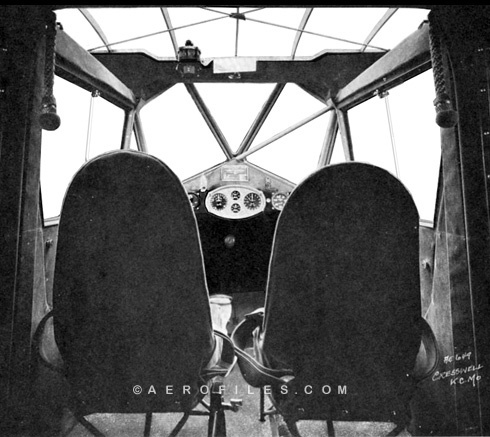 Single cockpit seated four. POP: 1 conversion of A-1, ordered by Wichita oilman H H Patton, but never finished.